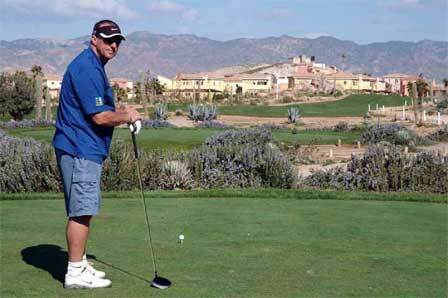 Sir Ian Botham’s very own Charity Golf Classic will be played at Sir ‘Beefy’s’ home course, the Desert Springs Resort and Golf Club in Spain, from the 11th – 13th October 2007, to raise funds for Leukaemia Research. A host of sporting celebrities & legends from the world of Golf, Football, Athletics Cricket, Rugby and the entertainment industry have confirmed their attendance and support of the event presented by CGTV Games Ltd.
Sir Viv Richards, Nasser Hussain, Steve Cram, Peter Baker, Gordan Brand Jnr, Paul Way, Malcolm MacKenzie, Phil Golding, Mark Davies, Roger Chapman, Steve Richardson, Matt Dawson, Mark Williams, Jimmy Case, Vinny Samways and Ronan Keating, are just some of the keen celebrities and professional sportsmen who have accepted their invitation to help their amateur teams of 3 to compete for this year’s trophy; playing 36-holes over two days. Desert Springs Resort and Golf Club is the only luxury desert resort in Europe. Located in the Almanzora region of Almeria, south-east Spain, it has the warmest, driest and sunniest winter climate on the whole of the Iberian coast and in Europe without exception. It recently won the Daily Mail Award for Best Almeria Development, the Bentley International Homes Awards for Best Spanish Development and Best International Architecture, as well as the 2006 Spanish National Madera Verde Environmental Award. In 2007, The Trade Leaders Club presented its New Millennium Gastronomy Award for the Tourism, Hotel and Catering Industry to El Torrente, the resort’s leading restaurant. Leukaemia Research was established in 1960 and is the only national research charity solely devoted to leukaemia and related blood disorders in both adults and children. The charity is committed to improving treatments, finding cures and learning how to prevent leukaemia, Hodgkin’s and other lymphomas, myeloma and other related blood disorders, which are diagnosed in 24,500 people in the UK every year. Its work depends entirely on voluntary donations. Java Trading Company today announced its agreement to become an Event Sponsor of this year’s Sir Ian Botham Charity Golf Classic at Desert Springs Resort and Golf Club. Java Trading Company specialises in roasting high quality espresso and filter coffee and the distribution of its product range throughout Europe and the Middle East. It recently supplied one million cups of its Java Gold Espresso to the rapidly expanding luxury hotel market in Dubai. The event programme includes one practice round and two competitive rounds of golf on the Championship Indiana Course. Participants will enjoy 2 nights luxury accommodation at The Lodge @ Desert Springs. The event culminates with a celebrity gala dinner and entertainment, including a chance to bid for ‘money can’t buy’ auction items. All proceeds from the event will be donated to Leukaemia Research. Sir Ian Botham on his home course, the Championship Indiana course at the Desert Springs Resort and Golf Club, Almeria, Spain.